Do you buy and sell stocks, bonds or mutual funds? Have you ever been in a situation where you have gains and your spouse has losses? There is a way that you can use your spouse’s losses to offsets your gains and save on tax by transferring capital losses to a spouse. We may have the tax strategy that you’ve been looking for. Suppose your spouse, Jane, owns shares in the stock market that she originally purchased for $50,000 and are now worth only $30,000. So Jane has an unrealized capital loss on these shares of $20,000. The first thing your spouse, Jane, will have to do is realize the loss on her shares. The way to do this is for Jane to sell her shares at the current market price of $30,000. Once she has done this and realized a capital loss of $20,000, you would then have to purchase these same shares at the market price of $30,000. According to tax laws Jane’s capital loss of $20,000 will be denied. The reason for this is if a share is sold at a loss and then the same share is acquired by someone affiliated to the seller within 30 days following the sale, the loss incurred by the seller becomes a superficial loss, and is thus denied. But we’re not finished yet, under Canadian tax laws the $20,000 capital loss incurred by Jane is added to the cost of your newly purchased shares. Hence your cost for these reacquired shares is the $30,000 you paid plus the $20,000 capital loss, making the total cost $50,000. The final step you need to take in order to use Jane’s capital loss is to re-sell the shares. Keep in mind that you are selling them at the current market value of $30,000, and the cost of these shares is $50,000. 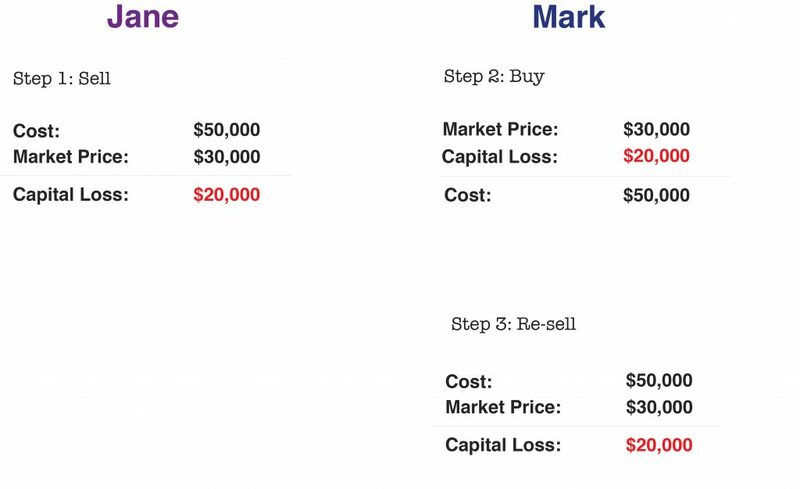 As a result of the sale, you have now realized a capital loss of $20,000 [sale price $30,000 less the cost of $50,000]. You have successfully transferred your spouse’s capital loss to yourself. You can now carry back this loss and recover a portion of your taxes paid on your previous year capital gains. As you can see with the right tax strategy, even capital losses can be transferred between spouses and used against past capital gains. Providing you and your spouse with even more tax savings. Also, learn how to save even more taxes by splitting income with your spouse.